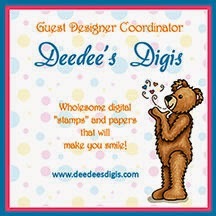 Sunday means it's New Release date at Digitstamps4Joy! I was able to play with the image called "1 in a Million". The papers are from my stash basket and the ribbon is some I had on hand. Thanks for stopping by today! God bless you!!! Oh what a fun card! Love the cheerful colors, the great papers, and the cute image! Great gumball image- the DP is great and loving the ribbon you added. This is a perfect card for summertime! Fantastic colorful card and I really love your choice of papers. Thank you for joining our challenge at Pile It On and please come back tomorrow for a brand new one. beautiful creation. love it. thankyou for entering the sisters of craft blog challenge. michelle dtx. Deedee's Digis - another FREEBIE!